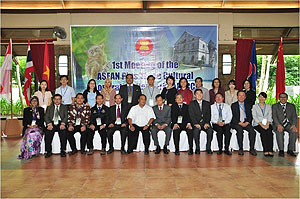 At the request of the Agency for Cultural Affairs, the Japan Consortium for International Cooperation in Cultural Heritage participated in the First Meeting of the ASEAN Plus Three Cultural Cooperation Network (APTCCN) held from July 20–23, 2012 in Bohol, Philippines. 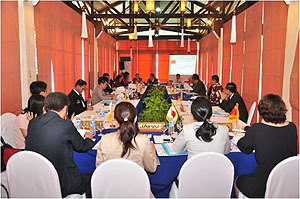 Representatives of ASEAN countries and three East Asian countries, Japan, China and South Korea, participated in the meeting, gathering information regarding future cooperation for safeguarding cultural heritage in these countries. Until last year, this meeting was called the Networking of East Asia Culture Heritage (NEACH), but the name was changed because the current five-year plan includes broader issues, as follows:. 3. and the necessity of common understanding in the areas of cultural heritage management, human resources development in the cultural context, and small- and medium-sized cultural enterprises development. The 40th anniversary of the ASEAN-Japan exchange is 2013. This meeting will be increasingly important in enhancing relations between ASEAN countries and Japan.